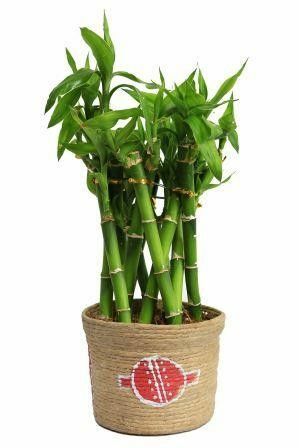 Appealing, elegant and innovatively designed, our Bamboo Cage design Lucky Bamboo is a perfect plant for your office and home decor. Not only is it reputed to bring good fortune, it is also a very hardy plant that can thrive in a simple vase of water and literally no direct sunlight. Low cost, high quality (AA grade) and easy maintenance make our lucky bamboo best green gifting option. Dimension: 4" x 4" x 7"
DO's: 1. Change the water every 15th day. 2. DO the pruning of old leaves and stem which turn yellow regularly to avoid fungal activity. 3. DO the pruning of roots 3 times a year using normal scissors. 4. Consider the lowest ribbon as a water level indicator. DON'Ts: 1. DON’T use chlorine water(usually tap water)as it kills the root. RO water is chlorine free and recommended. 2. DON'T over water or under water the plant. Ideally all roots should be submerged in water. 3. DON'T give direct sunlight otherwise the leaves will burn in summer , filterd light or morning sunlight is apt 4. Avoid temperature shock for better growth.